These beauties are called Speckled Roman tomatoes (harvested on 7/29). Here’s the description of them from the pack of seeds – “Intriguing paste tomato with orange & yellow stripes! Yummy flavor, very meaty, excellent for sauce, canning and freezing.” I found them to be slightly sweet w/ a light acidity. 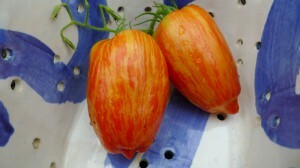 Pineapple tomatoes are sweeter but they take much longer to ripen. I definitely will be growing these again next year! 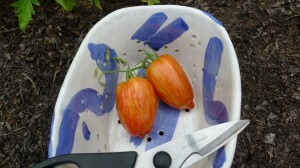 The prettiest tomatoes I’ve ever grown!! As you can see in the last photo, the interior has a lot of meat and very little juice and seeds. 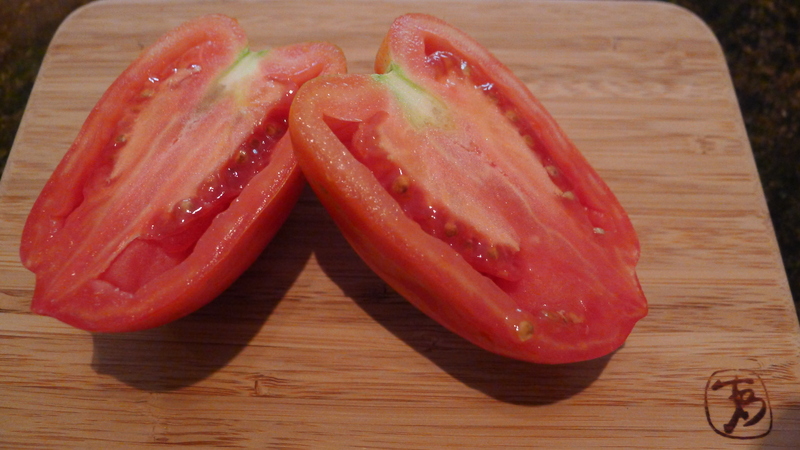 I’m sure they would be great for a sauce, but I prefer just slicing my homegrowns and making a tomato salad or putting them in a sandwich!